Our newest block of the month is Side Stripe designed by our very own Renee Tallman! Login to the MQG Community Site & access the Side Stripe pattern written by Renee Tallman for the MQG Block of the Month series. Use solids or prints in whites, off whites and creams as your neutral color & solids or prints from the color palette below as your pops of color. Complete block assembly through Step 5, stopping when you have two half-square triangles (do not sew your units into flying geese). Check out this color palette for this month’s Block of the Every Other Month! We’ve listed the Kona colors but we want to see you use prints for this one! See our blog post for full details! A previously secret shot of @uniquilter working until the last minute at #sbamqgretreat2017 on her original design that turned out to be our BOTEOM this month! We love the Side Striped pattern! So proud of our very own member Renee @uniquilter for being featured as an MQG block of the month contributor! So many amazing variations on this easy to make block! Check it out in today’s edition of MQG’s Modern Monthly and on the MQG community site under Resources. Our newest block of the month is Cogs! Login to the MQG Community Site & access the Cogs pattern written by Yvonne Fuchs for the MQG Block of the Month series. Use black as your background color & shades of green to yellow green as your corners. 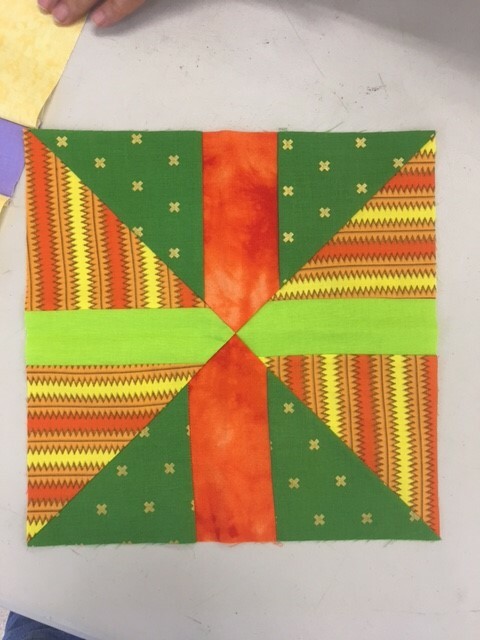 Our next Block of the Every Other Month is the Lopsided Four Patch! 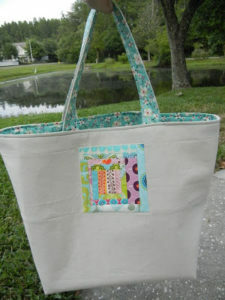 • Download Pam’s Lopsided Four Patch Pattern here! • Use gray and gold fabrics. • Bring your finished block(s) to the November meeting for a chance to win them all at the Block Lotto! Working on your Lopsided Four Patch Blick of the Ecery Other Month and need a photo tutorial? Swipe to see more! You can also check out printed directions on the blog! Blocks due at the November meeting! Excited about our Block of the Every Other Month and ready to get started on the current Scrap Block? •	Use your fat quarters from the July meeting swap and fabric from your stash in red-violet, blue-violet & yellow. Use solids or solid-ish fabrics for the stripes in the block. •	Bring your finished block(s) to the September meeting for a chance to win them all at the Block Lotto!